Who drank coffee this morning? I did and I’m pretty sure you did too. It’s difficult to imagine a day without my favorite cup of freshly roasted, organic and amazingly tasting coffee. I absolutely love the full aroma of fresh coffee beans, not to mention how that little tasty cup of java makes my day worth waking up for. There are many reasons why people drink coffee. For some it’s about that morning energy boost, where for others it’s simply about fulfilling that morning routine that gives us a better feeling about starting the day. No matter what makes you brew that morning coffee, there are many health reasons why starting the day with it is the right way to go. Here are a few insightful reasons why that morning coffee makes more sense than ever. 1. 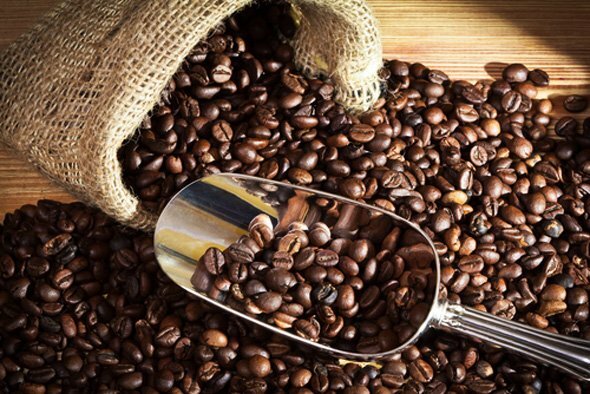 As the old story has it, coffee was discovered around 850 A.D. in Ethiopia by a goatherder who observed that his animals were unusually lively after eating berries. Inside those raw bright-red berries were the coffee seeds, which today we roasted and call coffee beans. Of the 25 or more major species of coffee plans, all of them are native to the tropics of Africa. 3. A new study found that drinking coffee could lower your risk of death. Researchers from the National Institutes of Health and the AARP, led by Neal D. Freedman gathered information from 229,119 men and 173,141 women who were part of the AARP Diet and Health Study. After 13 years, men who drank two to three cups of coffee a day had a 10 percent lower chance of dying, compared to men who didn’t drink coffee. Women who drank the same amount had a 13 percent decreased risk. While this is the largest study to examine the benefits of coffee, more research is needed to determine whether coffee can directly help people live longer. 4. The National Institutes of Health reports that approximately 30 million men are impacted by erectile dysfunction in the United States. New research suggests drinking 2-3 “cups of Joe” may prove beneficial for men’s erection. Men who consumed 85 to 170 mg of caffeine – or two to three cups of coffee – each day were 42 percent less likely to report erectile dysfunction than men who had 7 mg to no caffeine per day, according to a new study from the University of Texas Health Science Center at Houston. Findings are based on data from computer-assisted questionnaires issued to 3,724 men with an average age of 49 years who participated in the National Health and Nutrition Examination Survey. Those who drank 171 to 303 mg of caffeine each day were 39 percent less likely to say they experienced dysfunction. “Even though we saw a reduction in the prevalence of [erectile dysfunction] with men who were obese, overweight and hypertensive, that was not true of men with diabetes. Diabetes is one of the strongest risk factors for [erectile dysfunction], so this was not surprising,” –said Dr. David S. Lopez, lead author and assistant professor at the University of Texas–Houston School of Public Health. 8. A “Grande” coffee has as much caffeine as 7 cans of cola. A “Grande” has about three times as much caffeine (330 mg) as a normal-size cup of coffee. 9. 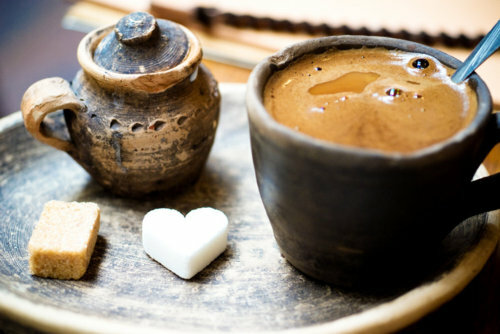 Some studies show that moderate coffee drinkers (1-3 cups per day) have lower rates of stroke then non-coffee drinkers. 10. Arabica beans have a richer flavor, are much smoother and a lot less acidic, while having half the caffeine of the Robusta bean. The best quality Arabica coffee grown in Latin America was being exported to Europe and Japan. 11. The Robusta beans, grown mostly in Vietnam, were sent to the U.S. to be roasted, ground, and packed into cans. 12. Besides the finest quality Arabica beans and artisan roasting, another secret to great tasting coffee is freshness. The shorter the time from the roaster to your cup, the better the coffee tastes. 13. It's OK to freeze coffee. Put it into small airtight plastic bags. To keep it fresh, but don't refreeze. 14. Johan Sebastian Bach, a notable coffee drinker, wrote a short opera called “The Coffee Cantata” about coffee obsession. 15. According to a study conducted by the Harvard School of Public Health, two to four cups of coffee every day can help people become more positive. The study saw the link between caffeine and lower suicide rate. According to the researchers, the right amount of caffeine can decrease the odds of suicide by up to 50%. Based on the findings, caffeine can provide the same effects as a mild antidepressant and not just a stimulant. Coffee does have the ability to make people feel good. What you didn’t know about Burke Brands coffee. In 1989 Darron Burke moved to Miami from New England in search of adventure. He soon met a beautiful Colombian girl named Eliana, whom he quickly fell in love with. Eliana and Darron traveled to Colombia to meet her parents, and the next morning he was given a cup of the richest, smoothest, best tasting coffee he had ever had. On that trip they visited several farms, met many coffee growers and learned a lot. They learned about the difference between Robusta and Arabica beans, and that Arabica has a richer flavor, is much smoother and a lot less acidic, and that it has half the caffeine of the Robusta bean. They discovered that most of the great quality Arabica coffee grown in Latin America was being exported to Europe and Japan, while the Robusta beans, grown mostly in Vietnam, were sent to the U.S. to be roasted, ground, and packed into cans. Eliana and Darron brought Colombian coffee brands back with them to the US, to see if their friends and family liked it as much as they did. Not only did they like it, but also they couldn’t get enough, and they were constantly asking them for more. Eliana and Darron recognized an opportunity and began growing coffee with a family friend in Colombia and roasting it in Miami. In Miami, they learned a lot about roasting. They discovered that the large coffee companies roasted their beans by the ton on a production schedule, warehoused them, and required large minimum orders from stores, so that by the time the coffee hit the retail shelves, it was months, and sometimes even years, since it was roasted. Eliana and Darron found that the fresher the coffee was, the better it tasted. They developed a unique model of roasting coffee in multiple small batch roasters, to-order for all of their customers large and small. They found that small batch roasting machines allowed them more control over the flavor. It’s a process that Eliana and Darron quickly realized was partly art and partly science. Further, they didn’t have to spray water on the beans to cool them quickly after they came out of the roaster, like the large roasting machines require, and because of this the natural oils remained on the beans and added significantly to the flavor. 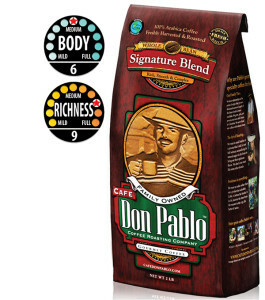 Darron put his picture on the front of his Don Pablo bag, because he wanted people to know that "we were a family business that grows coffee and is connected to farms and farmers all over Latin America." - he said. 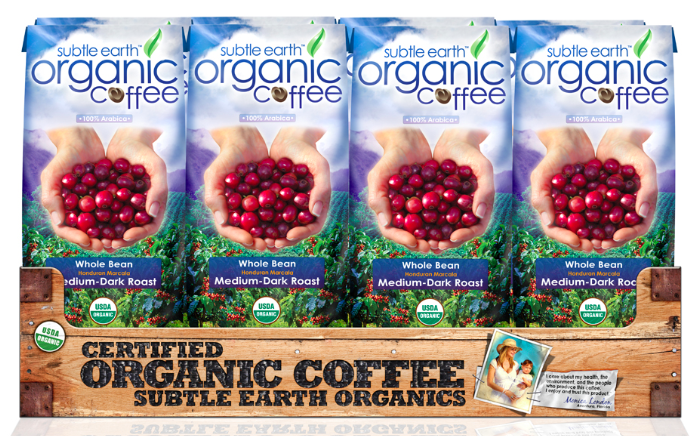 “Over the years, we had been getting requests for a certified organic coffee. Much of the Arabica coffee is grown organically, by small subsistence farmers who compost the fruit of the coffee bean and use vermiculture (worm manure) to fertilize, they also plant peppers to repel insects, and even use grafting and replacing vulnerable plants with ones that are resistant to fungus etc., but some customers were looking for the added level of assurance that a USDA certified organic coffee could provide. Because of this we created our Subtle Earth Organic brand. We are currently using a certified organic Honduran and a Honduran and Peru blend. Both are excellent tasting coffees, that have depth of flavor and complexity, are also rich and smooth, with low acidity, a clean finish and pleasant aftertaste. Subtle Earth is now being sold in Costco, Sam’s Club, and on amazon.com.